We’d love your help. Let us know what’s wrong with this preview of On the Verge by Alan Hirsch. To ask other readers questions about On the Verge, please sign up. Some helpful stuff here, especially for thinking about the church as organic system. This book has some good insights into mission of the church, but I would caution about using everything in this book. If you are not a fan of social gospel, this book will rub you wrong. The main thrust of the book is to try new approaches to church that take the individual outside of the four walls to reach the 60% who our unchurched. The book also bounces back and forth between the two authors, with one writing a chapter and the other critiquing it. I have enjoyed the book and in general the philosophy of ministry discussed in this and other books in the Exponential series. As a leader in a parachurch campus ministry there is much that applies to our context. Some helpful tips in leading culture change will be good to reference in the future. The primary focus of On the Verge is about a paradigm shift. Alan Hirsch and Dave Ferguson assert that the true core of Christianity is understanding that it is a people movement, not an institution. We have been doing and thinking about Church the same way since the days of Constantine. It isn’t working any more. It’s not true to our core identity, our DNA, as people following Jesus. Please don’t think this is simply about moving towards a more grassroots or “international” method of practicing/patronizing. 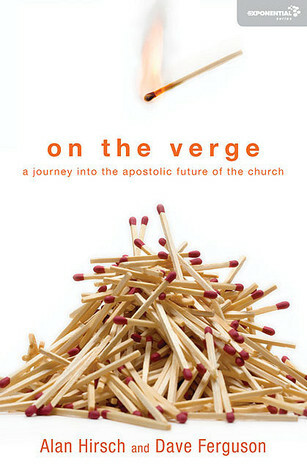 On the Verge isn’t another anti mega-church, pro simple church book. It’s a call for the western church to embrace the beauty of and. Shifting our paradigm is moving away from the battle that some of us feel between church growth methods and more organic styles of church. this is a non-fiction Christian book version of the the poem Jabberwocky. lots of impressive sounding words that when looked at closely mean nothing. i slogged trough p. 76, my pastor chose this for our book group this month, i'll be interested to see what people got this is a non-fiction Christian book version of the the poem Jabberwocky. lots of impressive sounding words that when looked at closely mean nothing. i slogged trough p. 76, my pastor chose this for our book group this month, i'll be interested to see what people got out of it or what meanings they give the book. Forgotten Ways + some new information from Dave. Best part are the practitioners information. It encourages me to no have an overly ideal assumption this comes easily, which it hasn't in my church. But these movements are everywhere and will prevail! Great read! Some good perspective on the American church culture. This is another gem from guys like Hirsch and Ferguson. Somewhat lengthy, but well worth your time. Would be helpful to take your church leaders and other key people through this book. A lot of good concepts, but sometimes difficult to fully grasp. It was somewhat complex. Very challenging, but after a while it became repetitive. A great resource for any church leadership team desiring to re-examine its mission and ethos. Alan Hirsch is the founding director of Forge Mission Training Network. Currently he co-leads Future Travelers, an innovative learning program helping megachurches become missional movements. Known for his innovative approach to mission, Alan is considered to be a thought-leader and key mission strategist for churches across the Western world. Hirsch is the author of The Forgotten Ways; co-author Alan Hirsch is the founding director of Forge Mission Training Network. Currently he co-leads Future Travelers, an innovative learning program helping megachurches become missional movements. Known for his innovative approach to mission, Alan is considered to be a thought-leader and key mission strategist for churches across the Western world. Hirsch is the author of The Forgotten Ways; co-author of The Shaping of Things to Come, ReJesus, and The Faith of Leap (with Michael Frost); Untamed (with Debra Hirsch); Right Here, Right Now (with Lance Ford), and On the Verge (with Dave Ferguson). Alan is co-founder and adjunct faculty for the M.A. in Missional Church Movements at Wheaton College (Illinois). He is also adjunct professor at Fuller Seminary, George Fox Seminary, among others, and he lectures frequently throughout Australia, Europe, and the United States. He is series editor for Baker Books' Shapevine series , IVP's Forge line, and an associate editor of Leadership Journal.